Looking out your window to see birds perched on your fence is a beautiful sight, but finding their droppings on the wood of your fence is less than appealing. Bird dropping not only look unsightly, the New Jersey Department of Health and Senior Services notes, they can pose a risk for disease as well. Clean the mess from your wood fence with the right methods and products to protect the wood from damage and to reduce your risk for exposure during cleanup. Use the least harsh method for removing bird droppings first, then proceed to stronger products as necessary. Hose down the affected areas of the fence with water from a garden hose. Use a low pressure setting to wet down the areas; spraying it forcefully may spread the droppings around. The idea is to wet the droppings first to avoid releasing spores during cleanup. Fill a bucket with hot water. Dip a stiff scrub brush into the water and scrub away as much of the droppings as possible. Rinse the areas again with water from the garden hose. Add a squirt of mild dish soap to the water if the droppings are still there. 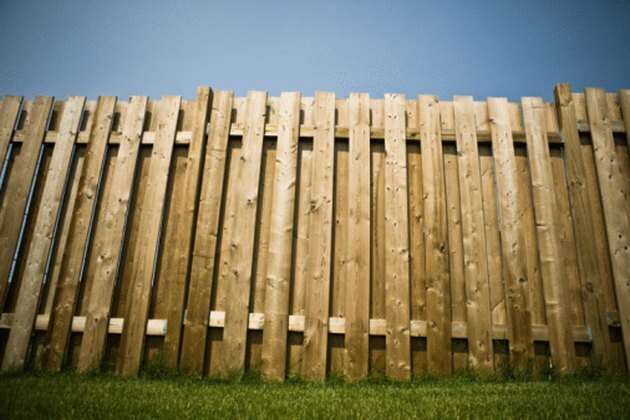 Use the stiff scrub brush and soapy water to scrub the fence again. Rinse the fence well with water from the garden hose. Mix a solution of trisodium phosphate and warm water if the droppings are especially troublesome. Combine 1 gallon of water and ¼ cup trisodium phosphate in a clean bucket. Scrub the droppings from the fence with a stiff scrub brush. Rinse the fence well with water from the garden hose.